My good friend Dave Grossman decided to trade in his 9 foot boat rods for 10 footers this year. After hearing those positive comments from Dave, I decided to give them a shot with my own clients, but I’d take it a step further. Instead of just incorporating them on float trips on the big rivers, I’d experiment using them on small to mid-size streams. The first trip out was a real eye opener and success with the ten foot fly rod on one of my 30′-40′ wide trout streams. To my amazement, the longer rod outperformed my standard 8 1/2-9 foot fly rods in almost all fishing scenarios in my clients hands. The only area the ten foot rod underperformed, were spots where the stream narrowed drastically or when it was really tight and cramped. The surprising thing about that, is it actually happened a lot less than I thought it would, and when it did, I’d just handed over the shorter rod I was carrying to my client. The key was positioning my angler in the correct spot, reminding him he had a longer rod in his hand, and then choosing the appropriate fly cast to present our flies. I continued the experiment for several more guide trips, and it quickly became apparent, that all the fly fishing literature I’d previously read about matching the length of your rod to the size stream you were fishing, was actually just one way of looking at it. If there’s one thing I’ve learned over the years with fly fishing, it’s that there’s almost always multiple options (types of casts, types of rigs, types of gear, ect.) that are feasible for anglers to use when fishing any given situation. Most of the time we end up going with the status quo, which is the obvious and most popular method for the fly fishing situation at hand. Sometimes, however, if we’re not afraid to think outside of the box, and open to use an unorthodox approach, it has the potential to end up performing even better for us on the water. benefits That I noticed with my clients when I put a longer fly rod in their hands. Ten foot fast action rods usually have a slightly softer tip, perfect for setting the hooks and fighting big fish on light tippet and small flies. My clients broke off less and landed more fish. In many cases, ten foot rods can make it easier for anglers to land big fish solo, because they have more rod to help them bring the fish in closer to net. You can often be stealthier with a longer rod because you can position yourself farther away from the fish without jeopardizing your presentation and drag-free drift. 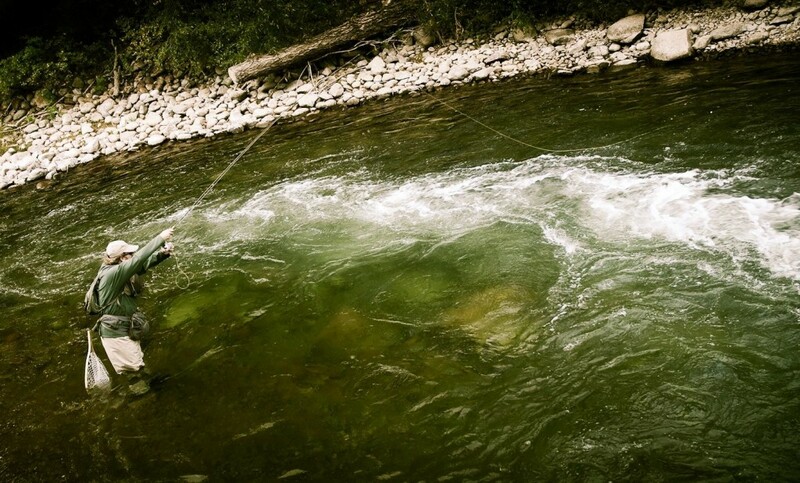 If a fish takes off down river or upstream of you, the longer rod can help maintain a sufficient angle on the fish, minimizing the chances of the hook dislodging. Are there some small streams where fly fishing with a ten foot rod won’t be feasible? Yes, there are lots, but the point of this post was to demonstrate you shouldn’t automatically think just because you’re fishing a small stream that you need to grab your short 6′-8′ fly rod. If you fish with friends like I do most of the time on small streams, it can really be an asset for the team if you pack different length rods. Since it’s typically best to fish one angler at a time so you don’t spook fish, you’ll usually only have one rod fishing at a time, and that will allow you to choose the best rod for the location your targeting. This entry was posted in Fly Fishing Gear, Fly Fishing Tips & Technique and tagged Fly Fishing, fly fishing blog, fly fishing with a longer rod, fly fishing with ten foot rods, Gink & Gasoline, Gink and Gasoline, Kent Klewein, long fly rods and benefits, Louis Cahill, small stream fly rods, ten foot fly rods, trout fishing, Who Says Short Rods Are For Small Streams by Louis Cahill. Bookmark the permalink. And there I was thinking you were doing to write about short rods and I was going to write about my 1pce 6’7″ 11wt I built and use either from my yak or Scanoe when I chase the big fish we have in the fresh in OZ. Not to worry. On my first trip to Kiritimati I took my 7’11” Sage Bass Bluegill and my guide thought it was hilarious until he saw how handy it was in the wind then all he wanted to do was have a fish with it. Yes the Bluegill has been to Kiritimati 3 times and the Large Mouth twice and yes they will go again at the end of the year. Great point Bruce. Short rods can definitely be beneficial in the salt! Honestly, what I’ve learned from tenkara is to use the longest rod you can cast on any given body of water. If you have a 15′ rod, and can cast it where you are wanting to fish, it will probably catch you more fish than a 9′ on the same stream. I regularly use a 15′ really soft tenkara rod on a redeye bass stream here in Alabama that is probably 20-40′ across in the main stretch I fish. This lets me place my fly pretty much wherever I want, have little to no line on the water, and not have to move around a lot. It’s pretty fantastic. Exactly! I never leave the house without a 10-11ft rod! The trend toward Czech nymphing and switch rods just further endorses the long rod on small water. On my home waters here in MI it’s not uncommon to see some spey rods being used on 35 foot rivers. I’ve even been seriously looking at those Winston Microspey..
Keep up the great work – we appreciate it. Thanks for the comment David! I love my long nymphing rods. I always carry one with me with very few exceptions when it comes to the size of the stream. Great article, in the last year I’ve switched to a 10ft rod for Carp fishing on small still waters here in the UK. Greater control of the fly and line and much better when playing the fish, especially when they try to dive into the reeds at your feet. I enjoy fishing with long rods except when it comes to landing big fish. I ho not have enough hand/wrist strength to hold my spey rod in one hand and net in the other. Similarly on coastal streams in Oregon we fish out of one man prams for Salmon. The longer the rod, the more difficult it is to land the fish solo. We fish with 9′ or shorter. Long rods, advantage fish. What are your thoughts on a 10 foot 5 wt or 6 wt out of a drift boat?